here we are with 10 types of shoes that you need to avoid for your foot health. Foot pain has always remained quite a hurting problem for the women love to be trendy. Women clutch the habit of changing their lovely shoes as per the occasions. The shoes mostly utilized by women for distinct events are heels. The highness of trendy heels definitely makes them look eye-catching, attention grabbing, stunning and a fashion icon. Beauty undoubtedly holds a significant position in the life of a lady but is it more important than your health? Why are you wearing uncomfortable or painful shoes? Is it the right way to treat your health? No, not at all! Health must always be our first concern whenever we move to the markets for buying distinct necessities of life. Shoes provide you support at different events and upon distinct days. It’s good to be a fashion follower, everyone’s should adopt the latest styles but keeping one’s own self in pain is not at all fair with your body. Wearing uncomfortable or painful shoes could bring a lot of negative effects over your well-being. In order to avoid injuries, we should always go for the right walking techniques with the utilization of right walking comfy shoes. 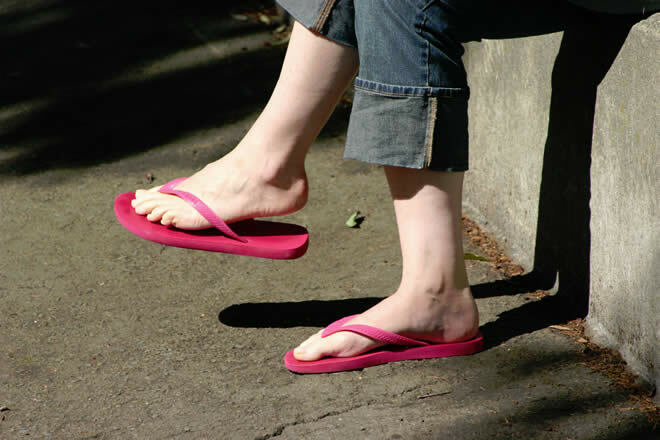 Flip flops or other flatter forms of sandals offer people freedom of walking. They are soft, light, colorful, flat and bouncy in emergence. They are designed in quite a striking manner but unluckily they lack the expected care, support and backing. According to a recent research, flip flops are frequently becoming the reason of various kinds of foot disorders including ankle sprains, planter fasciitis and tendon problems. Stilettos carrying super stylish, elegant and classy façade efficiently hold every girl in its magic. They are high, attractive and chic. But the high rank of gorgeousness is also gripping a high amount of risk. Stiletto even after being so popular can’t restrict themselves from being painful for its possessors. They cause extensive foot pain, which if neglected could even transform into a disorder. These are pointed and pressurize the entire body weight to the forefoot. Foot pain starts from being too flat or too high. Even being simple and comfy at first, ballet flats lead to severe foot pain as it holds nothing to support your worthy feet. These type of shoes hold zero arch shape and a very little stuffing to keep your feet a bit incline. Ballet flats do not allow your body part to function properly and ultimately makes you suffer through knee, back and hip issues. Platform shoes undoubtedly add height to your body. These are safer than heels but the regular use of platform shoes could cause your ankle instability. They give less pressure to your forefoot but we can’t count them out of risk as they are rigid, risky and exert force on the metatarsal bones, ultimately leading to foot pain and ankle instability. Wearing worn-out shoes when you are already suffering through foot pain is none the less than a blunder. According to the current era doctors, worn-out shoes hold the powers of accelerating foot issues. Such shoes do not absorb shocks and make you a victim of bad foot health. Long slipper boots designed with sheepskin lining definitely holds outstanding attraction for the ladies especially during winter season. They are quite stylish and comfy in appearance but conversely they are offering severe foot threats. Considering them heaty, girls usually start employing such shoes without any sort of socks. Such attempt could call a bundle of problems to your life as they can build fungus into your feet. Such shoes are not very supportive and cause extensive foot pain in case of standing or walking for a longer period of time. High heel boots are quite similar to stiletto heels. They are dangerous for the health of your feet, cause extensive foot pain and could even damage your nerves depending upon the height and time of usage. These are tight, uncomfortable, high and non-stretchable causing various types of risks to your legs and feet. Such type of heels holds great surface area and divides your weight quite evenly over the entire shoe. These are thick, stable and bumpy but still put a lot of pressure over your forefoot. The consistent use of such shoes could make you pass through far-reaching foot pain, eventually develops the hazard of osteoporosis. The pointy cone shaped shoes are getting quite higher in fashion but the adoption of such heels could make your foot suffer through a bundle of problems including nerve pain, hammertoes, blisters and bunions. The shoes squeeze the forefoot and put a lot of pressure over them. These are dangerous and damage toenails with endless compression. Celebrities are known around the globe for their outstanding style statements. They are magnetic, glossy, charming and superb to be followed. But in some cases, their following could create a heap of issues for you. Celebrities hold an extraordinary influence over the fans. Hence, ladies today even strive to adopt celeb’s footwear. One should never ever do that as they could even wear 12 inches heel having all the precautionary measures. But for you it could become a lifelong foot pain.